Is your PC Capable of Playing HD Video from Blu-ray and HD DVD? Home > Computer Hardware, Computers and Internet > Is your PC Capable of Playing HD Video from Blu-ray and HD DVD? Note: All the above CPU’s are Dual Core. Even my Dual core Pentium D 930 @ 3.0Ghz is not enough. 1. HDCP (High-Bandwidth Digital Content Protection) compliant display (DVI, HDMI connections) for digital output. If you don’t have a dual core cpu then you are out of the game right away. I don’t know how many people will be able to afford such high end configuration; even Windows Vista does not require such a configuration. 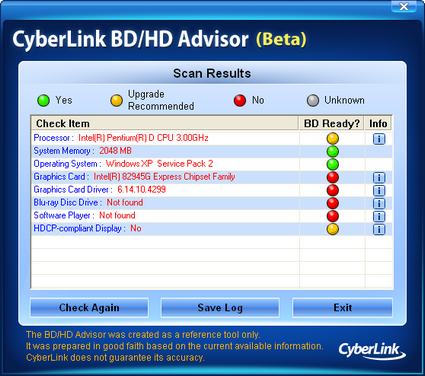 Another thing I come to know by going through system requirement is: Cyberlink software is resource hogger and I hope to see a better alternative soon. Does your computer confirm to these requirements? Please give your feedback. You can also post your results here using the cyberlink tool.